For most students who decide to further their education in college, their experience begins at the age of 18 or older. However, this isn’t the case for Youngstown State University student Jenna Provino, who began her first semester at 14 years old. 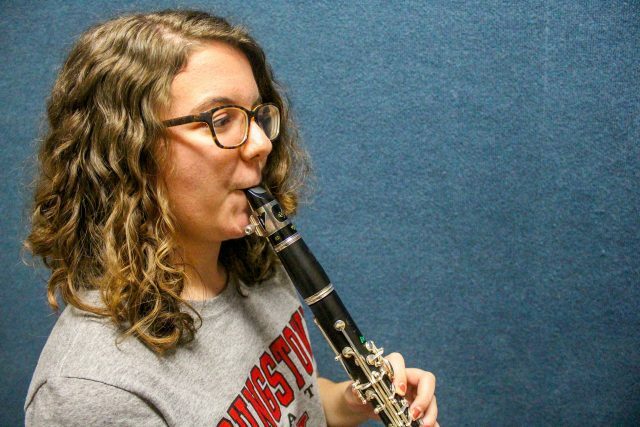 Provino, a junior music education major, chose YSU because her father and aunt are alumni, and she felt welcomed by the faculty immediately after her first college visit in 2016. “I started school a year early, skipped fifth and seventh grade and combined my junior and senior year of high school into one year,” she said. Provino attended public schools in Celebration, Florida, and during her final year in high school, she decided dual enrollment at Valencia College was a comfortable change of pace. Under the direction of Alice Wang, assistant professor of music, Provino studies the clarinet with the Dana School of Music’s clarinet studio. Provino’s first music audition landed her in the highest ensemble, alongside much older and experienced players. Provino has been playing the clarinet for eight years and considers her studio a home away from home. “It might be nice to have the normal schooling experience, but the people I’ve met because I made the choices I did would have never been in my life if I went standard,” she said. Provino’s brother, Jacob Provino, is also a junior music education major at YSU, studying tuba. Although he is 19 years old and she is now 17, they assist each other to the best of their abilities. A love for music runs deep in Provino’s family tree of band directors and music teachers. When the siblings began high school together, they pretended to be twins so Jenna Provino wouldn’t lose respect due to her age at the time at just 11 years old. Jacob Provino said at the end of the day, he enjoys seeing his sister around in Bliss Hall often.